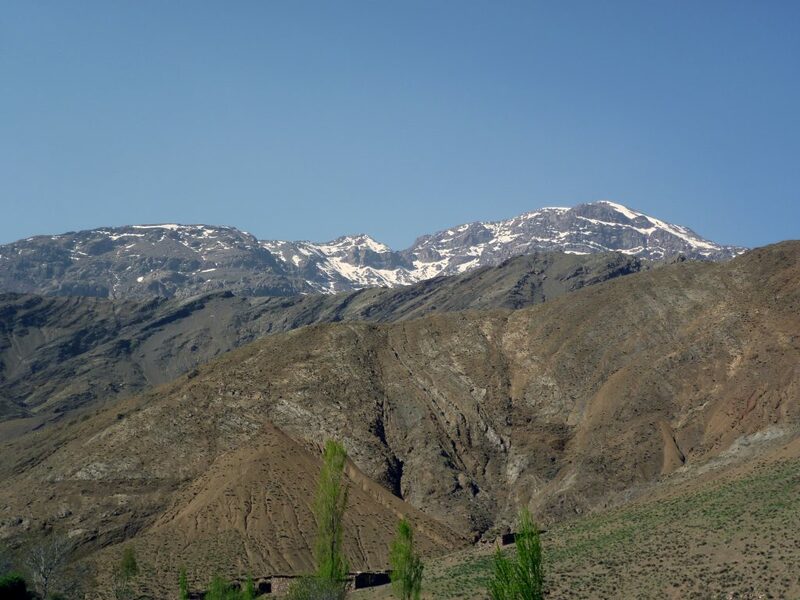 I have choosed Dades Valley, located between the peaks of the High Atlas and the Jbel Sarhro mountain range, because of its contrasts. 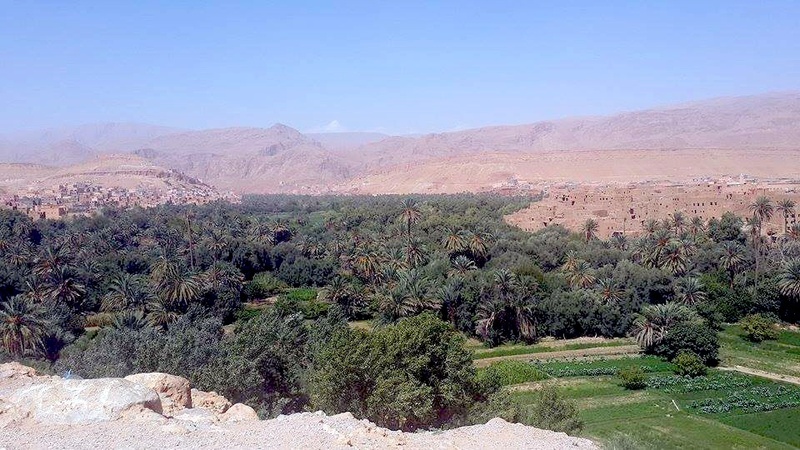 Known as ‘The Valley of One Thousand Kasbahs’, it is the most prominent of the oasis valleys that dominate southern Morocco. It is, also, the heart of rose growing country. Damask roses were first planted by French settlers, and are harvested to produce an essential oil, used in “Eau de Rose”. Hiking along Dades Valley is not a demanding challenging experience: even if you are not a keen mountaineer, you will still enjoy it. If you enjoy hiking at lower altitudes, surrounded by fantastic scenery, then this is a trip for you. 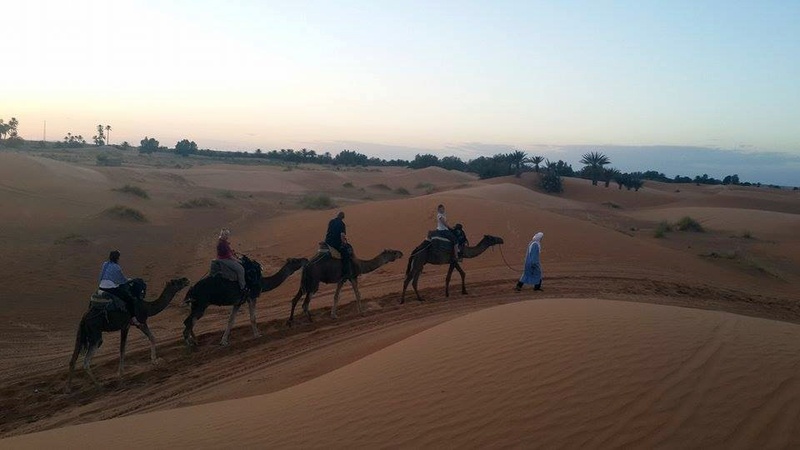 You’ll have the opportunity to experience the Bedouins life as long as we will traverse Erg Chebbi dunes from Yasmina to Merzouga. 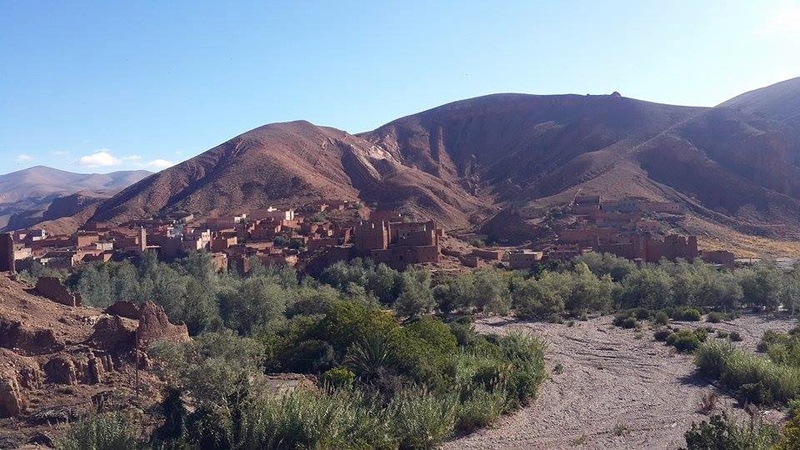 At the end of the trip, before coming back to Marrakesh we will visit Ait Ben Haddou; as Lonely Planet says “this UNESCO-protected red mudbrick ksar, 32km from Ouarzazate, seems frozen in time, still resembling its days in the 11th century as an Almoravid caravanserai”. 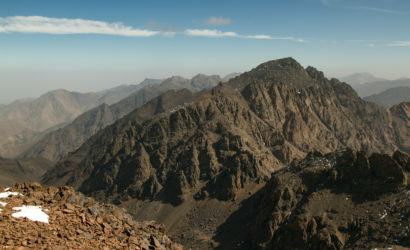 If you want to go higher up and climb the highest summit of North Africa (Toubkal-4167m), then you might consider this expedition. The cost mentioned (1050€) is calculated for a group of 8 persons. Transfer to our riad which is located not far away of Medina, and its famous Jamaa el Fna square. For dinner, we will select a local restaurant where we may have the opportunity to experience for the first time the taste of Moroccan cuisine. Why not try a delicious tajine and round off your meal with mint tea or Arabic coffee? 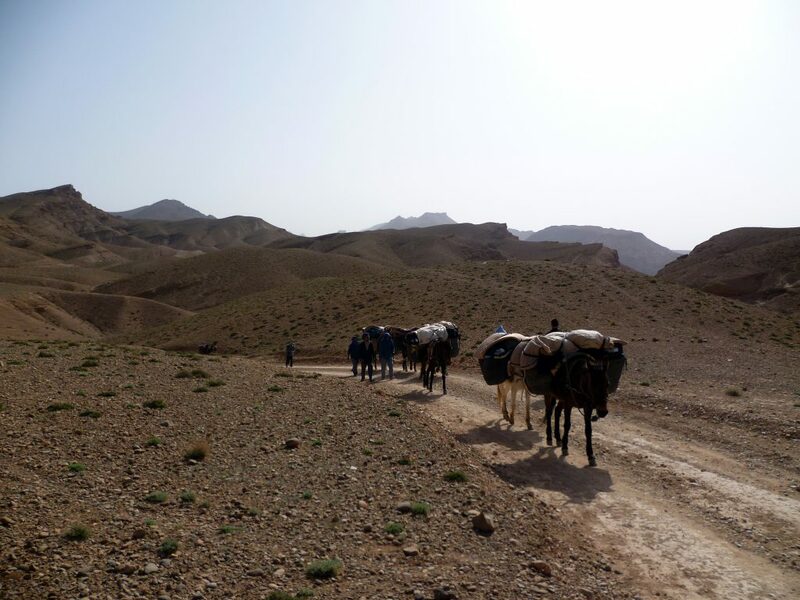 Scenic transfer to Dades Valley. We leave our hotel after breakfast, beginning our scenic transfer by minibus to our trekking destination, the Dades Valley. 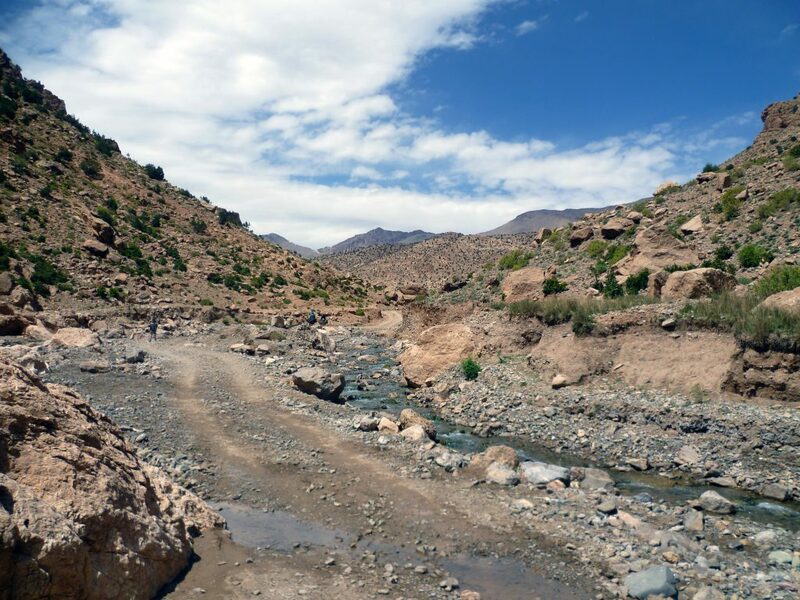 Firstly, we will cross the spectacular Tizi n’Tichka Pass of the High Atlas Mountains. 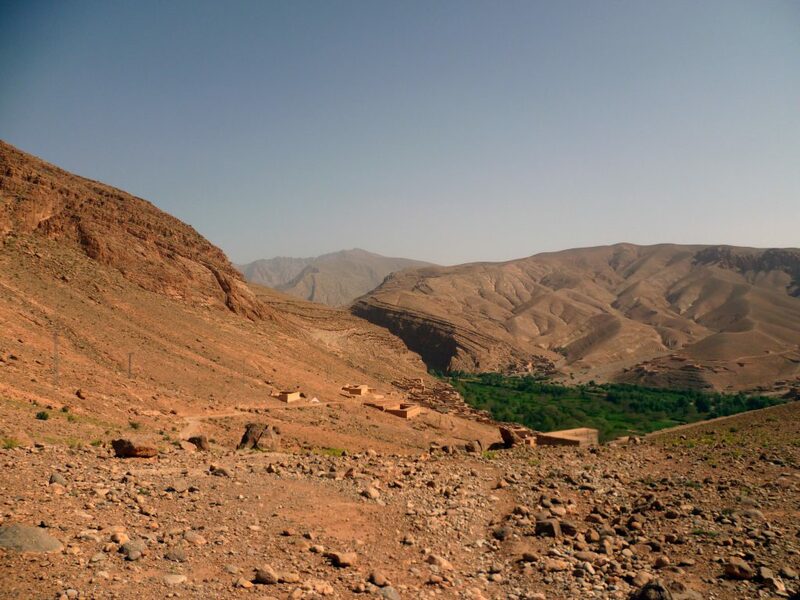 We will venture through many Berber villages, heading into the desert, where you can admire riverside oasis and barren hillsides clustered with Kasbahs. 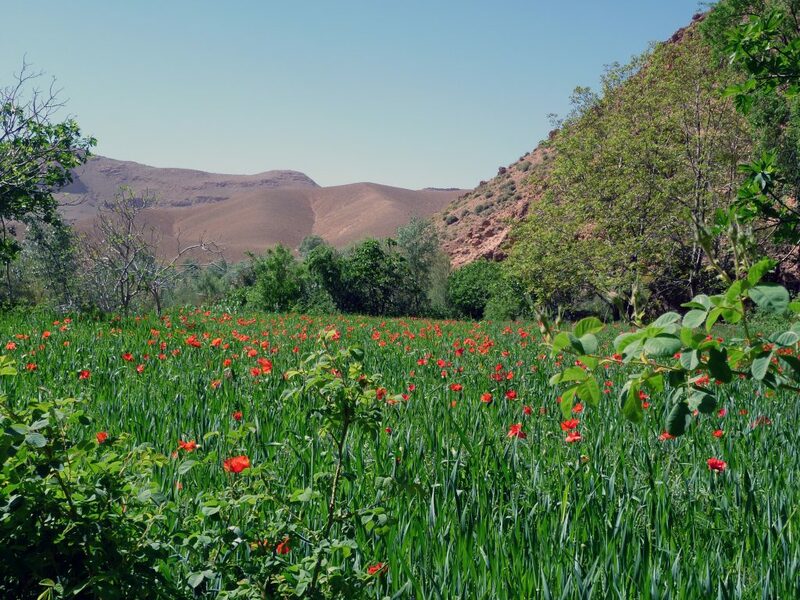 After lunch, we travel further into the Valley of the Roses, with stunning views of the Dades valley. Overnight accommodation at a gite in Ait Youl. A gite consists of a village house with simple dormitory accommodation, each with space for approximately 6-8 people. Furnished in traditional Berber style; low couches (beds), tables, carpets and cushions. Showers are usually available, sometimes hot! 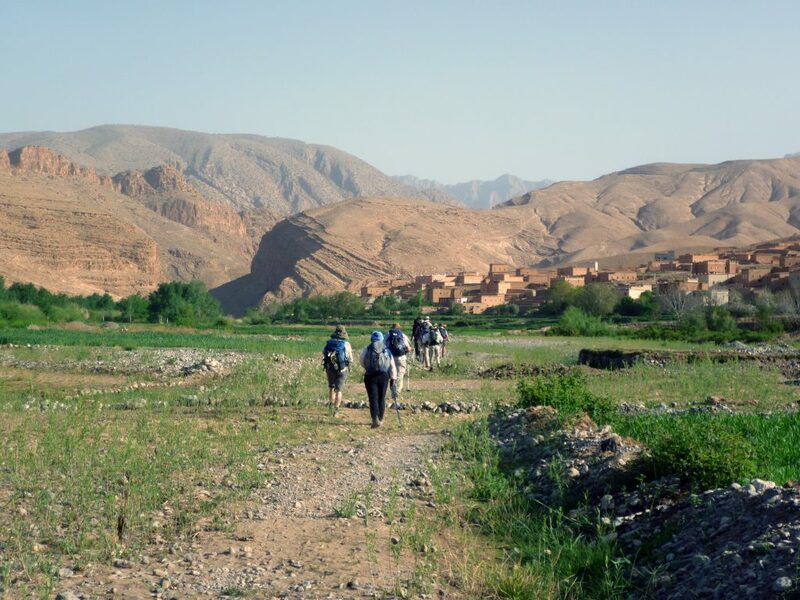 Today we will start our trek and straight away will enjoy spectacular views of this delightful valley as we walk towards the small village of Ait M’Rao. We will look out of improvised shelters made by Berber shepherds who tend their flocks in the pastures. After breakfast we’ll leave our gite and will have the fun task of crossing the river. It will be a unique opportunity to refresh ourselves for the rest of the day. The landscape becomes filled with imposing high ridges and summits along the route and in the afternoon you will be surprised by the lush green vegetation that surrounds the village of Alamdoune. 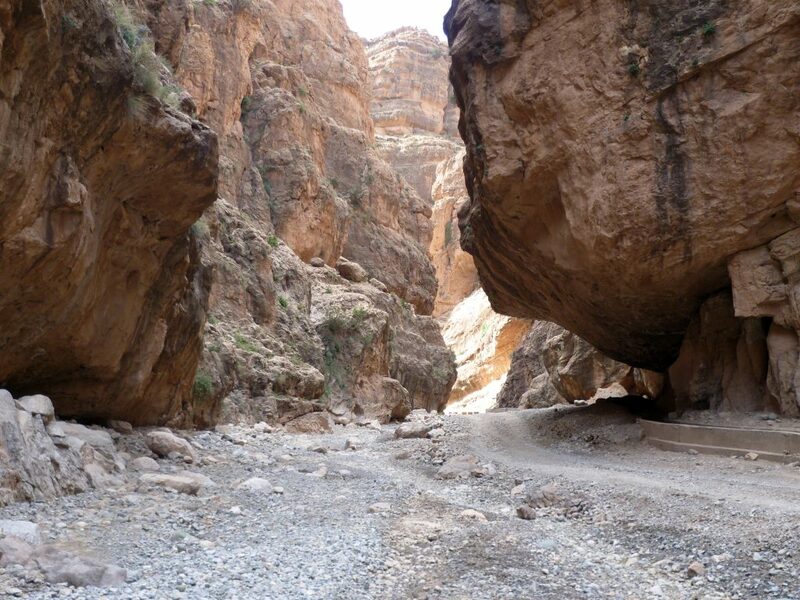 Today we’ll start exploring the fantastic narrow gorges typical of this area. 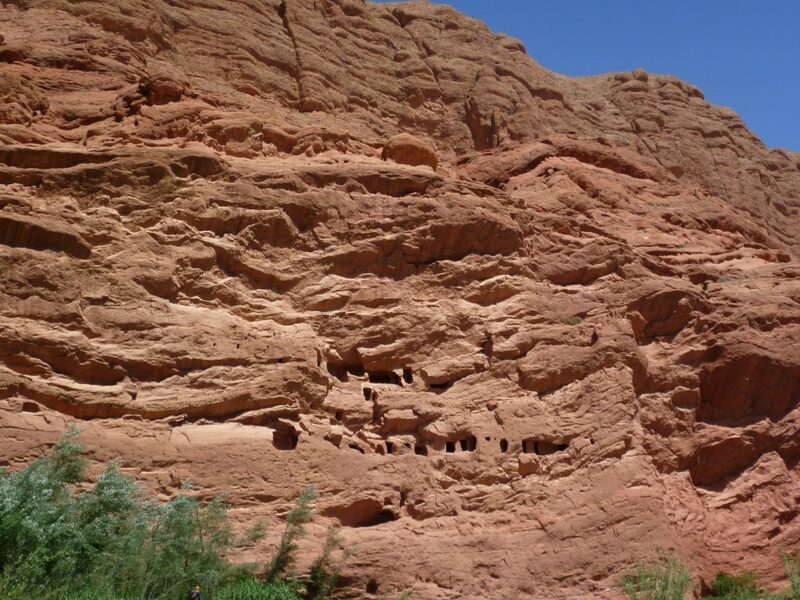 After passing through some picturesque Berber villages, we’ll enter into the world of the red rocks. The views are breathtakingly and with the mid-day heat, you can try cooling off in one of the refreshing small waterfalls dotted around the gorge. On our last trekking day, we’ll enjoy traversing another wonderful gorge. 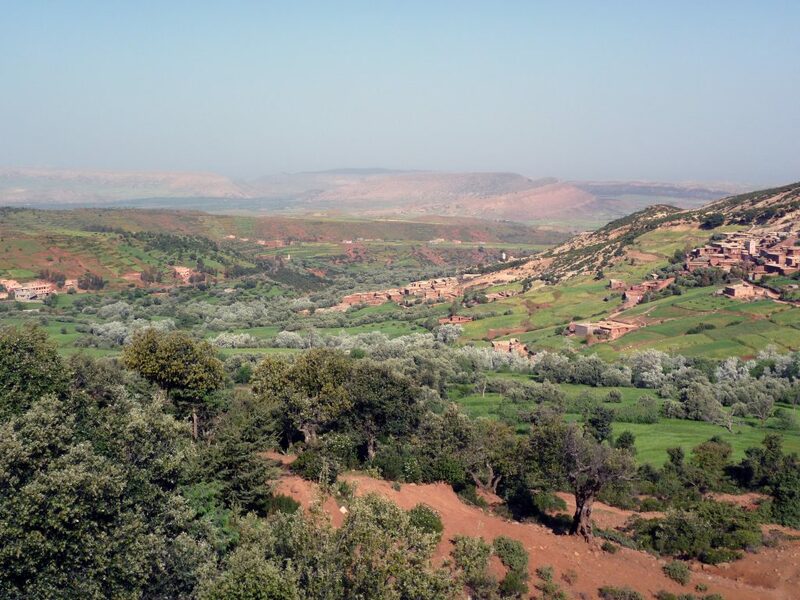 Further along, the valley flattens out and you will see settlements along the riverbanks where the Berbers are able to cultivate the land. The next challenge will be reaching the other side of the river! A successful crossing means we have reached the village of Bou Tharar. From Bou Tharar to Yasmina stopping at Dades Gorge, Todra Gorge and the Palmeraie du Tinghir. In the afternoon, we arrive in the desert with reddish sand dunes, where we join the camel caravan (~ 1 hour walk on the camels). We head towards a Berber camp with tents hidden among the sand dunes. In the evening and even at night, we can admire the sky with millions of stars. In the morning, we explore the desert and a little bit of what this experience means. 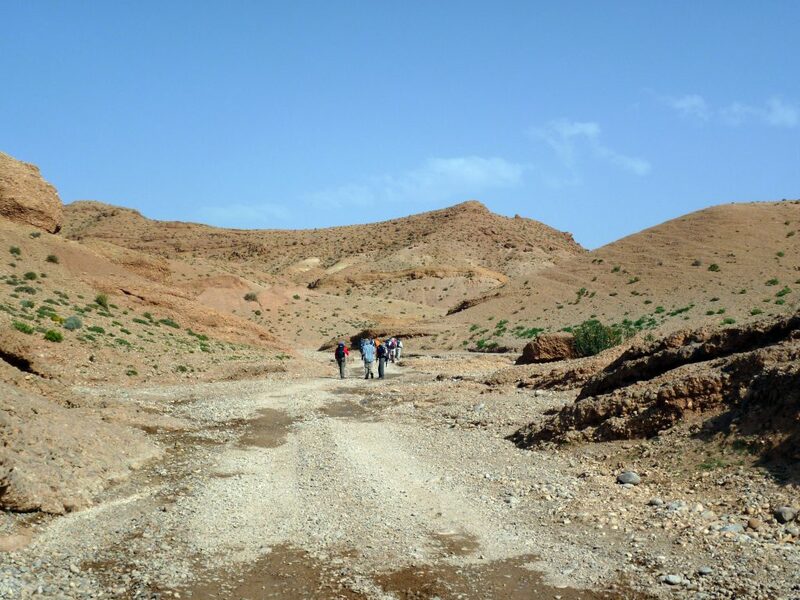 We walk ~ 5-6 hours by camel, including the time dedicated for a picnic lunch in a shady spot in Tissardmine Oasis. We may meet nomads, who live in the desert near oases and wells during winter and up into the mountains during summer. 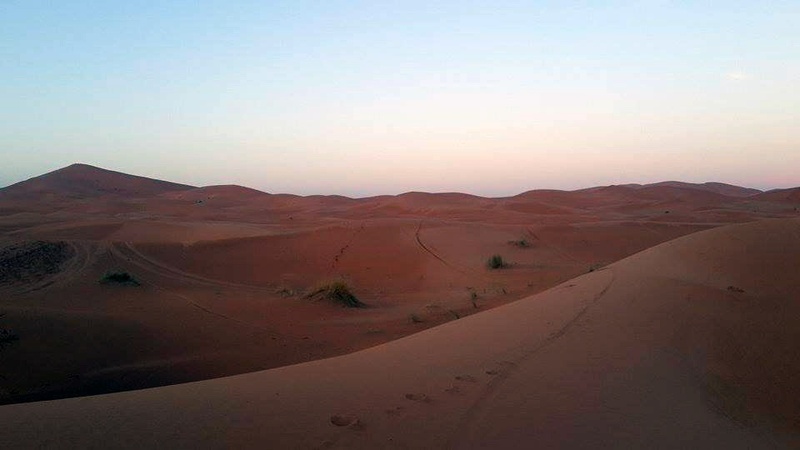 In the evening, we sleep in Berber tents based in Erg Chebbi dunes (the second highest chain of dunes in Morocco). We can make a short excursion through the dunes in the moonlight. 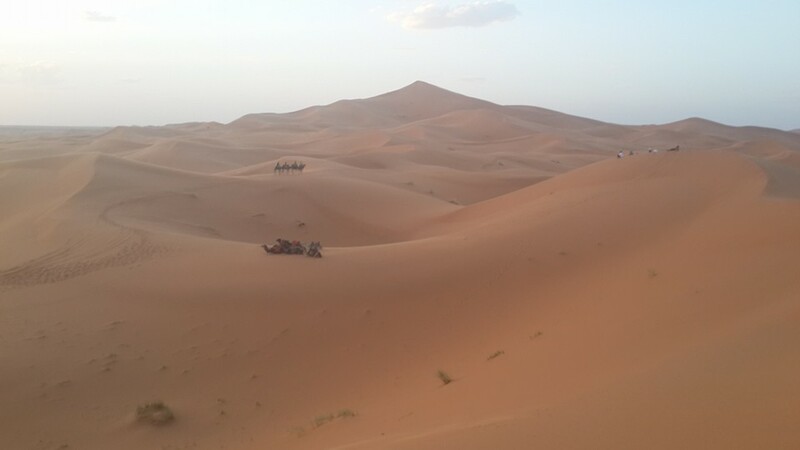 We’ll wake up early in the morning to get the chance of admiring a magnificent sunrise and we’ll ride the camels back to Merzouga. 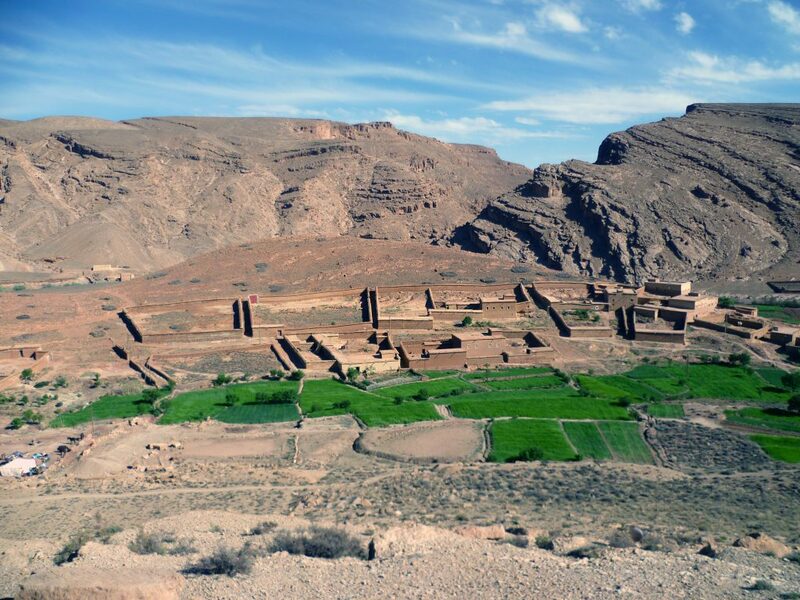 Transfer to Kasbah Ait ben Haddou in the Draa Valley. Some movies (Lawrence of Arabia’, ‘Gladiator’, ‘The Mummy’, ‘The Last Temptation of Christ’, ‘Kundun’, ‘Alexander’, ‘Kingdom of Heaven’, ‘Babel’, ‘Game of Thrones’, etc) have been filmed here, and the Ksar (fortified city) is on UNESCO World Heritage List. After a final breakfast at the hotel , we will meet up with our driver for the return journey to Marrakech. 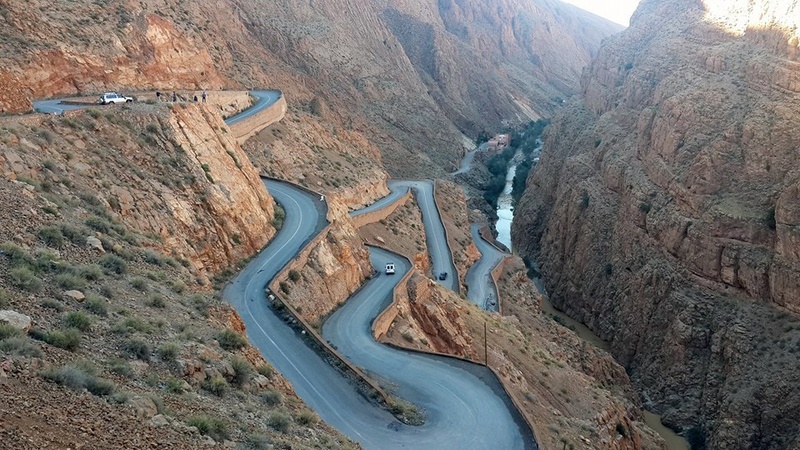 We will follow the same route traversing the Atlas Mountains (over the Tichka Pass). 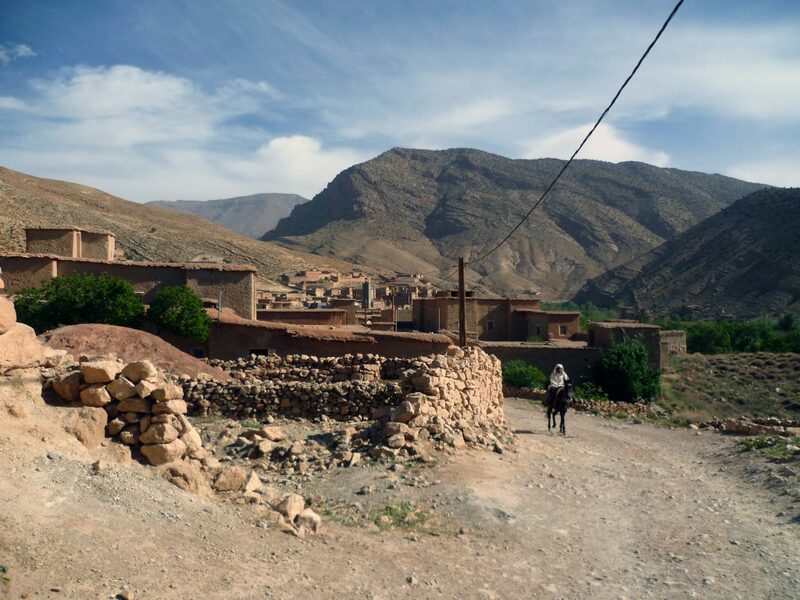 We will take a short break in Tadart , where you will have the chance to visit a kasbah. Later we will stop shortly for visiting a store belonging to an Argan Cooperative. Here, you might look after Argan Oil products, valued for their health and skin enhancing properties. In the evening, we will reach Marrakech, just in time for dinner. Accommodation for the next two nights is provided at the same riad/hotel in Marrakech. 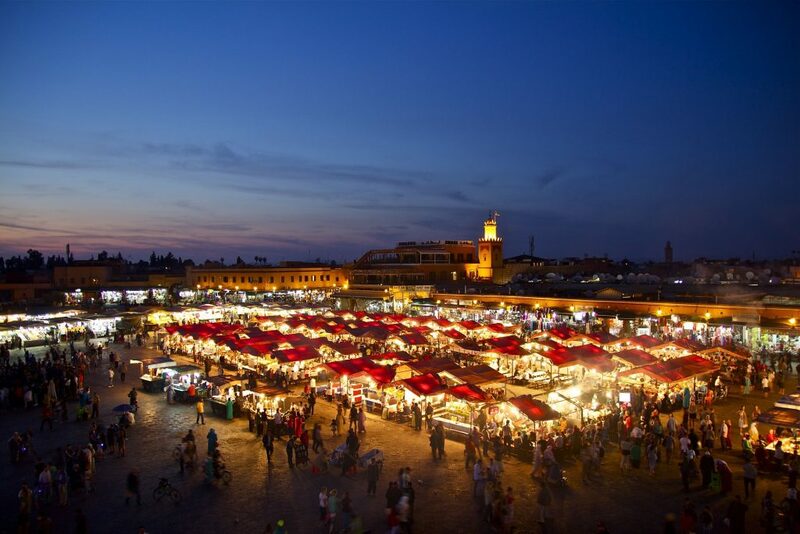 Today we’ll explore the ‘Red Town’ of Marrakech and we’ll visit the famous Jamaa el Fna square. At the Souk, a traditional market, can practice your negotiation skills with the local traders and grab yourself a bargain like typical Moroccan pointed slippers called ‘babouche’. We’ll admire the incredible architecture of Koutubya mosque and we’ll enjoy the shade of the trees and tranquility of the Majorelle garden. After breakfast, you may have the opportunity to squeeze in another shopping trip before checking out of the hotel (that will depend of your flight schedule). Transfer by minibus to Menara International Airport for the flight back to your home country.